The bus driver is extremely nice and is willing to drop us off directly otherwise it would have been a 15 minutes walk from town. 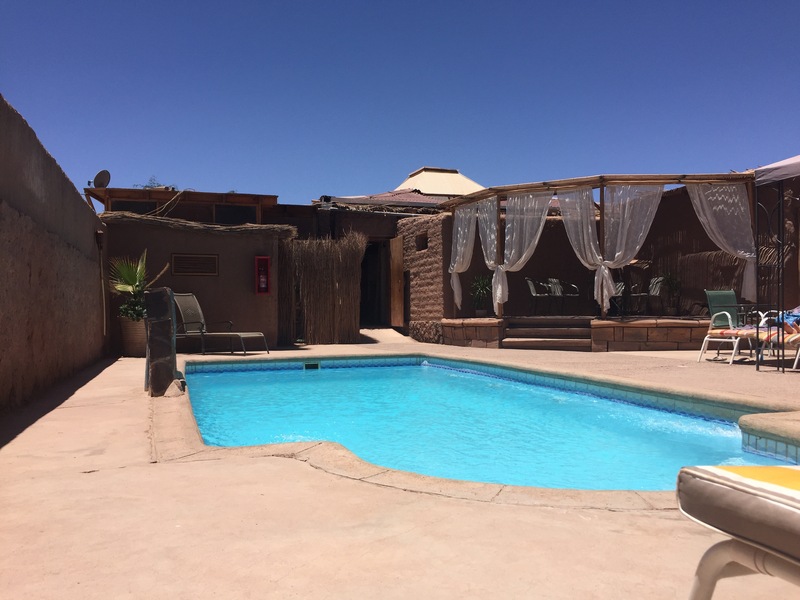 We check in and I do what is now my normal routine: figure out what I want to do when I get to a place and calculate that if I am really productive, I will have seen what I want and able to leave in two days for a beach in Northern Chile. 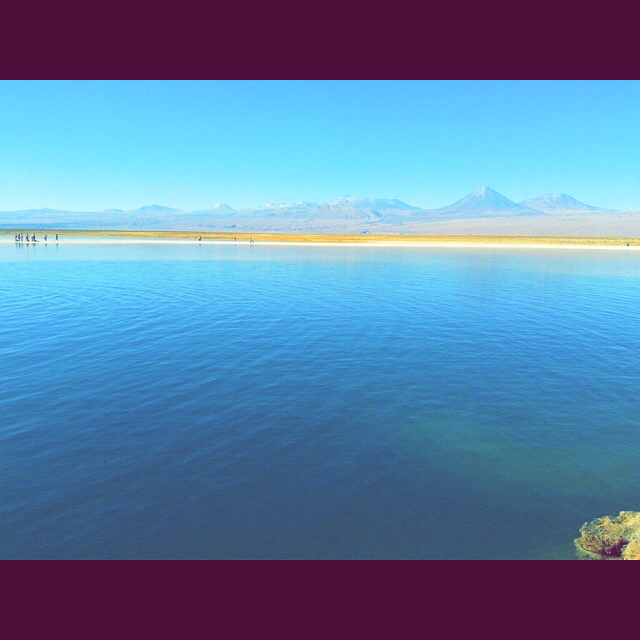 Pretty close to San Pedro, there is a very interesting lagoon in the world’s third largest salt flat, Salar de Atacama. Well technically the Laguna Cejar is a sink hole lake and because the salt flat has no drainage system, it is extremely salty. As in you can float ALA Dead Sea salty in the warm waters but be prepared for salty skin afterward then a briskly cold shower. The entrance fee was quite high compared to other attractions but it is less than a flight to Jordan or Israel and the view of mountains is breathtaking so I would say go and visit! 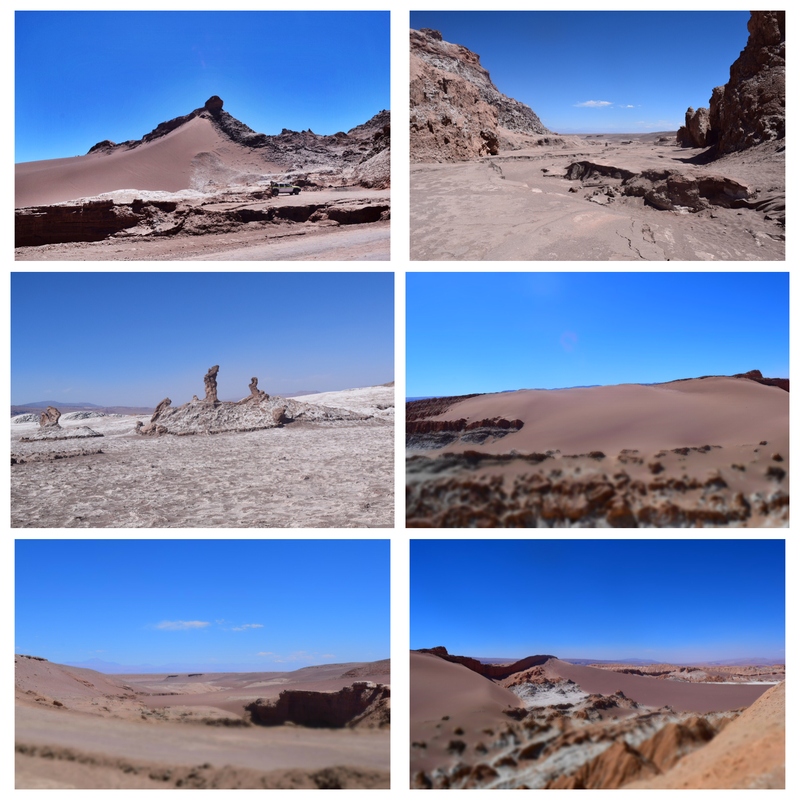 Valle de la luna- moon valley which is so called because it is supposedly resembles the surface of the moon. 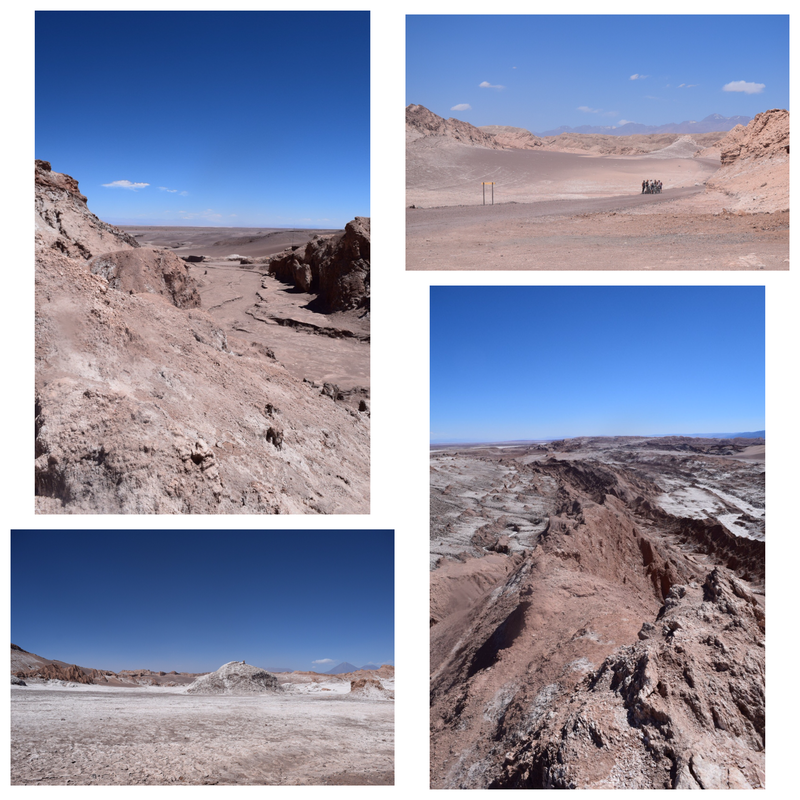 The Atacama desert is the driest place in the world and there are parts in this valley that have purportedly not received any rain in hundreds of years. You can drive (or take a tour bus) or TR: bike in as this group did (though not too impressed as they tried to hitchhike with us) and then walk/hike around in the park. The sand and stone formations were created by water and wind and made for such an unusual landscape. And combined with the white crust of long evaporated lakes, it really was like no other place on earth and it actually seems like you are entering another world. 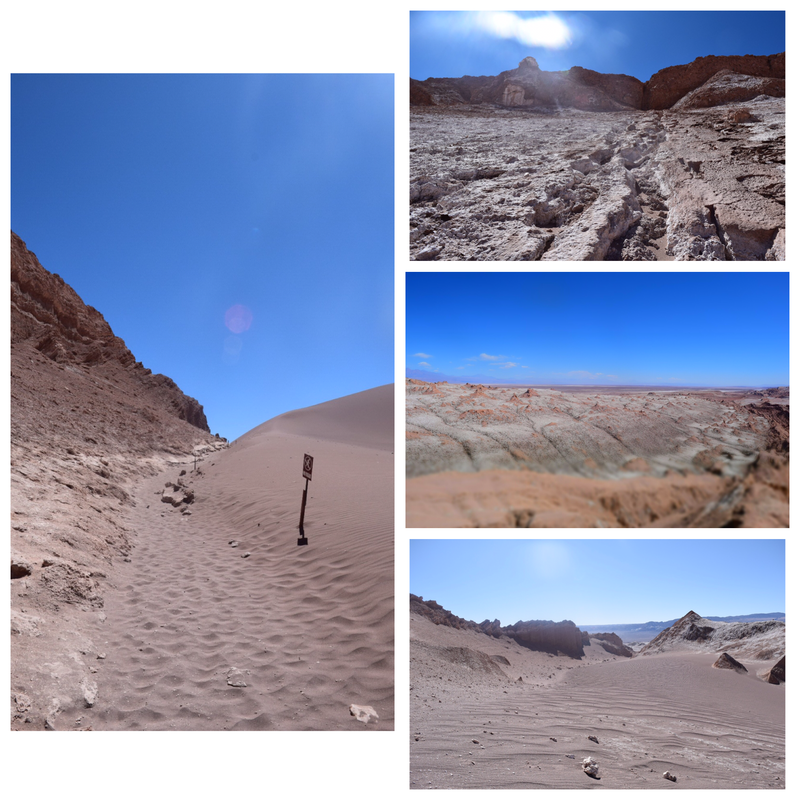 I can see why many outer space films are set here…I did feel that I was on Mars at times. TL & BL: The twisted and narrow ways through the caverns – it actually gets dark enough that you need a flashlight later on. 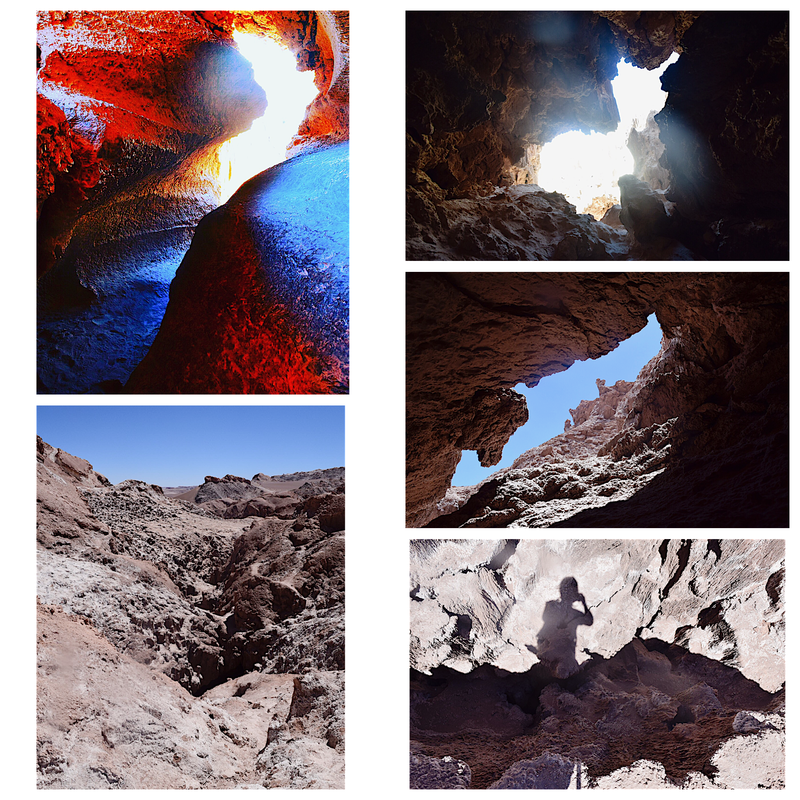 TR & MR: Looking up at various points in the caverns BR: Looking down and with my fear of heights, this shot is a big deal The sand is actually darker than it looks (due to black volcanic ash) in the pictures and gets so hot in the desert sun. I did not make a good choice in wearing flip flops but it would not deter me from exploring and enjoying this incredible place nor would my companion but that is a cautionary tale for another time. I have done everything that I wanted to in San Pedro so when F at reception asks me to stay one more night, I tell him that I think I am leaving in the morning. 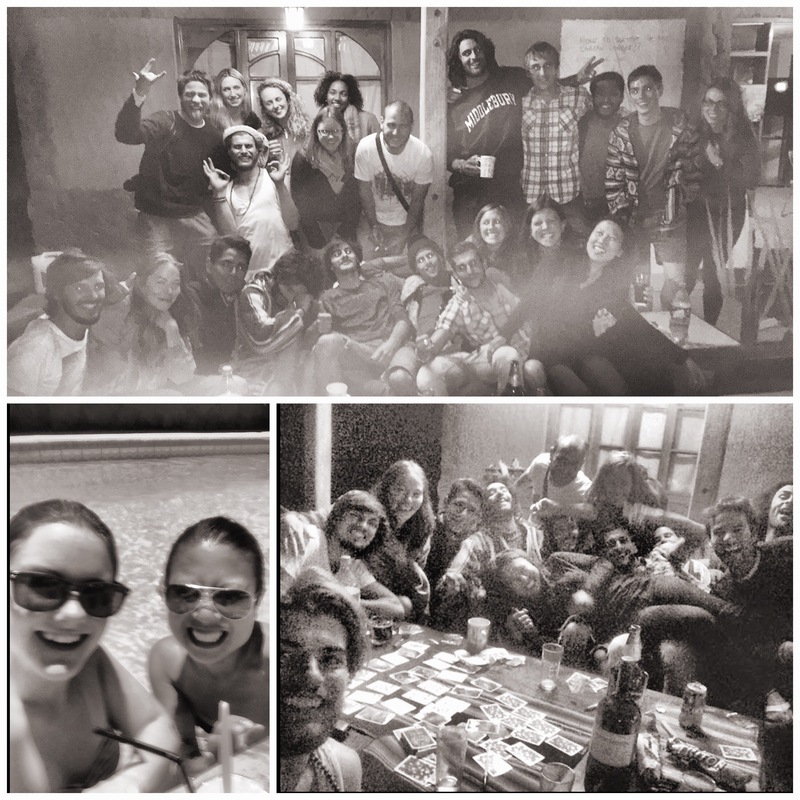 But the debate is as follows: go to the beach alone or stay in San Pedro with friends? I wake up the next morning still undecided but end up taking a friend to the hospital because she is so sick. It ends up being a lengthy affair and when we return in the afternoon, I decide that I will stay one more night ~ now the question becomes something that I hear from everyone. Though with a view that never gets old and sunsets like those pictured above, I do not mind staying at all. Oh let’s go look at the stars…yes – let’s. 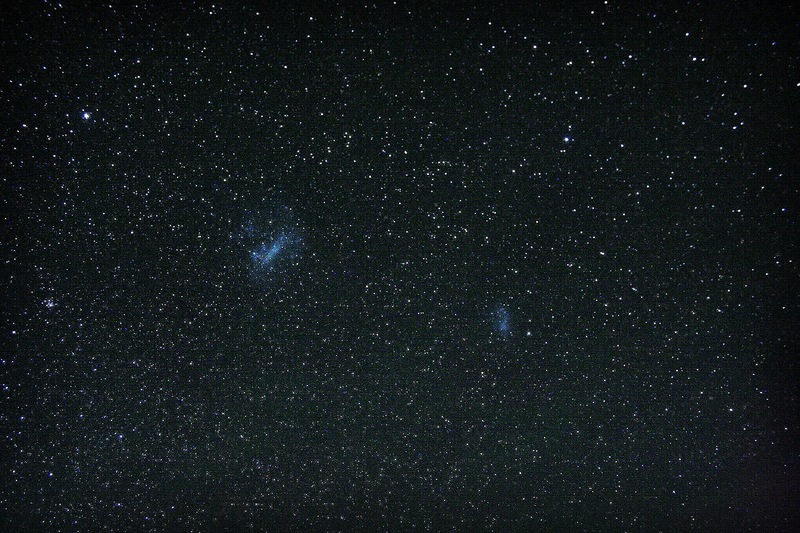 But no pictures can ever do justice to the feeling of being underneath the sky and looking up at the Southern sky in the Atacama desert. One of my favorite things about being being outside of town is how amazing the stargazing is…best part about staying one more night, well one of the best parts. While exploring the town, we come across a spa that offers yoga classes. My Spanish is definitely conversational and I learn it can be a little tough to do yoga when it is taught in Spanish ~ too bad that is the most challenging thing about the class! We end up getting a deal on a yoga class, massage, smoothie and access to the (very cold) pool and have an amazing girls day. Hmm – I had a lot of good meals here including a delicious pizza but didn’t take a pic and forgot to record names of all the restaurants L: This was one of the best meals I had in South America actually: Pork chop with orange sauce and roasted potato that was part of the daily set menu with an appetizer, entree and dessert for 4,000 Chilean pesos – less than $6 USD. 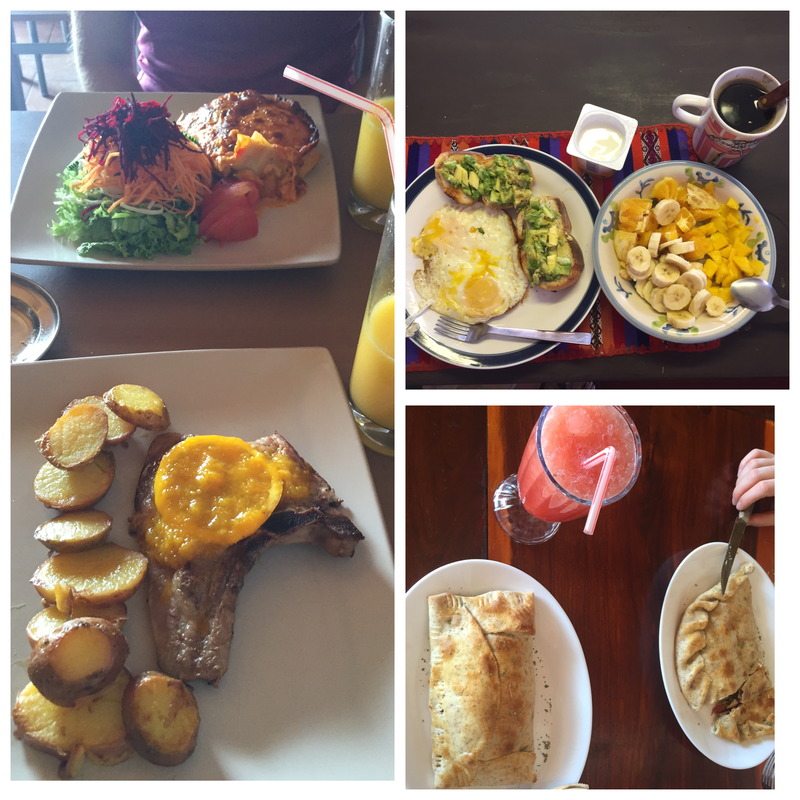 Also pictured is the veggie lasagna that my friend had and she said it was delicious (December 1, 2015) TR: Homemade breakfast : avocado toast with fried eggs + mango, banana, orange fruit salad + yogurt + coffee = amazing (Cimas del Sol, December 3, 2015) BR: Yummy empanada with the most refreshing and tasty sandia (watermelon) agua fresca (December 2, 2015) I absolutely adore this travel quote from Tim Cahill: “A journey is best measured in friends, rather than miles.” So many of us changed our plans and stayed longer because the vibe was so amazing here as in ‘ ok, maybe just one more night’. Sometimes a perfect set of circumstances come together while traveling ~ a great setting (a not too big place set outside of town with fun nightly activities like paintballing and delicious BBQs) + amazing people + incredible (and very long) nights of games/bonfires/drinks/fun = best place any of us have ever stayed at. How I will always fondly remember this place, those stars and these friends. Even though he is the one that booked my airport transfer for tomorrow morning, F teasingly asks me “just one more night?”…I answer him with a “maybe soon I will be able to return” and we finish in unison “for just one more night’! Next Post Before I die I want to….Life, Love & the Pursuit of ?